St Andrew’s Sporting Club kicked off it’s 5th season since Iain Wilson took over with a British Bantamweight Title fight between two Scots. Kash Farooq sensationally stopping Jamie Wilson in the first round to become the holder of the coveted Lonsdale Belt. I caught up with Iain alongside Kash and his trainer Craig Dickson to discuss the night and the future for the new champion. With both boxers tied to St Andrew’s I wondered how promoter Iain felt and were his emotions split on such a big night for the club. With BBC Scotland on board to broadcast future fights this will be a major step forward for boxing in Scotland, Iain gave his thoughts on this and also what he would ideally like to see happen next for Kash. 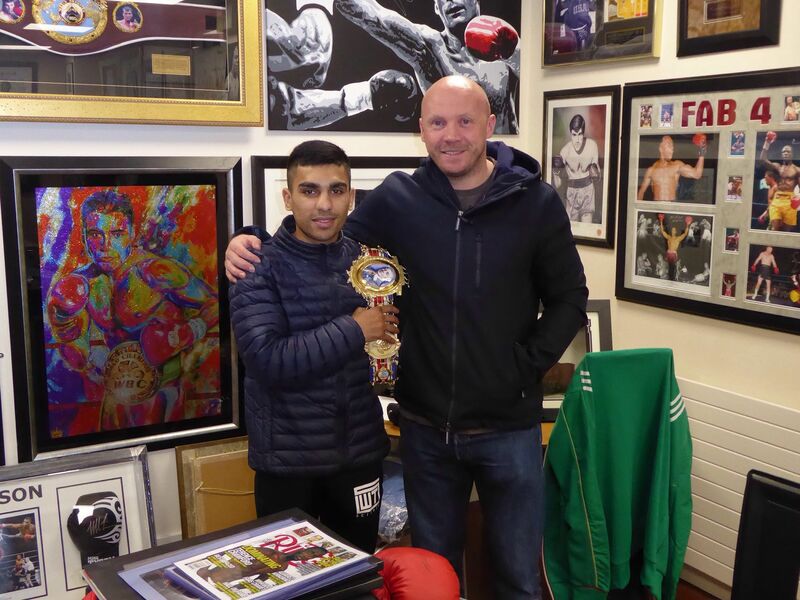 Turning to Kash I explained that a look through the record books shows that he is the 5th quickest in history to win the Lonsdale Belt at Bantamweight after only 10 fights. With Stuart Hall and Drew Docherty having done it after 9, Johnny Owen also in 10 and Jim Higgins way back in 1920 having won it after 8 fights. Kash however was more pleased that he had become the first Pakistan born fighter to win the Title. We moved on to discuss how Kash celebrated on the evening of the fight and he admitted there were no wild celebrations. Showing how strong the bond is between fighter and trainer was evident at the end of the fight as the team embraced each other, I asked them to describe what the win meant to both Craig and first of all Kash. Finally, everyone else has had an opinion on where Kash should go from here, what did the man himself think. A young man with his feet on the ground. Humble, polite, dedicated and accommodating, it’s impossible not to like Kash and you get the impression that he still doesn’t realise just how good he is. Those history books could well be in for a few more updates!